Not to be confused with Stellar archaeology or a journal on archaeoastronomy. The rising Sun illuminates the inner chamber of Newgrange, Ireland, only at the winter solstice. Archaeoastronomy uses a variety of methods to uncover evidence of past practices including archaeology, anthropology, astronomy, statistics and probability, and history. Because these methods are diverse and use data from such different sources, integrating them into a coherent argument has been a long-term difficulty for archaeoastronomers. Archaeoastronomy fills complementary niches in landscape archaeology and cognitive archaeology. Material evidence and its connection to the sky can reveal how a wider landscape can be integrated into beliefs about the cycles of nature, such as Mayan astronomy and its relationship with agriculture. Other examples which have brought together ideas of cognition and landscape include studies of the cosmic order embedded in the roads of settlements. Archaeoastronomy can be applied to all cultures and all time periods. The meanings of the sky vary from culture to culture; nevertheless there are scientific methods which can be applied across cultures when examining ancient beliefs. It is perhaps the need to balance the social and scientific aspects of archaeoastronomy which led Clive Ruggles to describe it as: "...[A] field with academic work of high quality at one end but uncontrolled speculation bordering on lunacy at the other". In his short history of 'Astro-archaeology' John Michell argued that the status of research into ancient astronomy had improved over the past two centuries, going 'from lunacy to heresy to interesting notion and finally to the gates of orthodoxy.' Nearly two decades later, we can still ask the question: Is archaeoastronomy still waiting at the gates of orthodoxy or has it gotten inside the gates? Two hundred years before Michell wrote the above, there were no archaeoastronomers and there were no professional archaeologists, but there were astronomers and antiquarians. Some of their works are considered precursors of archaeoastronomy; antiquarians interpreted the astronomical orientation of the ruins that dotted the English countryside as William Stukeley did of Stonehenge in 1740, while John Aubrey in 1678 and Henry Chauncy in 1700 sought similar astronomical principles underlying the orientation of churches. Late in the nineteenth century astronomers such as Richard Proctor and Charles Piazzi Smyth investigated the astronomical orientations of the pyramids. The term archaeoastronomy was first used by Elizabeth Chesley Baity (at the suggestion of Euan MacKie) in 1973, but as a topic of study it may be much older, depending on how archaeoastronomy is defined. Clive Ruggles says that Heinrich Nissen, working in the mid-nineteenth century was arguably the first archaeoastronomer. Rolf Sinclair says that Norman Lockyer, working in the late 19th and early 20th centuries, could be called the 'father of archaeoastronomy'. Euan MacKie would place the origin even later, stating: "...the genesis and modern flowering of archaeoastronomy must surely lie in the work of Alexander Thom in Britain between the 1930s and the 1970s". Early archaeoastronomers surveyed Megalithic constructs in the British Isles, at sites like Auglish in County Londonderry, in an attempt to find statistical patterns. In the 1960s the work of the engineer Alexander Thom and that of the astronomer Gerald Hawkins, who proposed that Stonehenge was a Neolithic computer, inspired new interest in the astronomical features of ancient sites. The claims of Hawkins were largely dismissed, but this was not the case for Alexander Thom's work, whose survey results of megalithic sites hypothesized widespread practice of accurate astronomy in the British Isles. Euan MacKie, recognizing that Thom's theories needed to be tested, excavated at the Kintraw standing stone site in Argyllshire in 1970 and 1971 to check whether the latter's prediction of an observation platform on the hill slope above the stone was correct. There was an artificial platform there and this apparent verification of Thom's long alignment hypothesis (Kintraw was diagnosed as an accurate winter solstice site) led him to check Thom's geometrical theories at the Cultoon stone circle in Islay, also with a positive result. MacKie therefore broadly accepted Thom's conclusions and published new prehistories of Britain. In contrast a re-evaluation of Thom's fieldwork by Clive Ruggles argued that Thom's claims of high accuracy astronomy were not fully supported by the evidence. Nevertheless, Thom's legacy remains strong, Krupp wrote in 1979, "Almost singlehandedly he has established the standards for archaeo-astronomical fieldwork and interpretation, and his amazing results have stirred controversy during the last three decades." His influence endures and practice of statistical testing of data remains one of the methods of archaeoastronomy. It has been proposed that Maya sites such as Uxmal were built in accordance with astronomical alignments. The approach in the New World, where anthropologists began to consider more fully the role of astronomy in Amerindian civilizations, was markedly different. They had access to sources that the prehistory of Europe lacks such as ethnographies and the historical records of the early colonizers. Following the pioneering example of Anthony Aveni, this allowed New World archaeoastronomers to make claims for motives which in the Old World would have been mere speculation. The concentration on historical data led to some claims of high accuracy that were comparatively weak when compared to the statistically led investigations in Europe. This came to a head at a meeting sponsored by the International Astronomical Union (IAU) in Oxford in 1981. The methodologies and research questions of the participants were considered so different that the conference proceedings were published as two volumes. Nevertheless, the conference was considered a success in bringing researchers together and Oxford conferences have continued every four or five years at locations around the world. The subsequent conferences have resulted in a move to more interdisciplinary approaches with researchers aiming to combine the contextuality of archaeological research, which broadly describes the state of archaeoastronomy today, rather than merely establishing the existence of ancient astronomies, archaeoastronomers seek to explain why people would have an interest in the night sky. Archaeoastronomy has long been seen as an interdisciplinary field that uses written and unwritten evidence to study the astronomies of other cultures. As such, it can be seen as connecting other disciplinary approaches for investigating ancient astronomy: astroarchaeology (an obsolete term for studies that draw astronomical information from the alignments of ancient architecture and landscapes), history of astronomy (which deals primarily with the written textual evidence), and ethnoastronomy (which draws on the ethnohistorical record and contemporary ethnographic studies). Reflecting Archaeoastronomy's development as an interdisciplinary subject, research in the field is conducted by investigators trained in a wide range of disciplines. Authors of recent doctoral dissertations have described their work as concerned with the fields of archaeology and cultural anthropology; with various fields of history including the history of specific regions and periods, the history of science and the history of religion; and with the relation of astronomy to art, literature and religion. Only rarely did they describe their work as astronomical, and then only as a secondary category. Both practicing archaeoastronomers and observers of the discipline approach it from different perspectives. George Gummerman and Miranda Warburton view archaeoastronomy as part of an archaeology informed by cultural anthropology and aimed at understanding a "group's conception of themselves in relation to the heavens', in a word, its cosmology. Todd Bostwick argued that "archaeoastronomy is anthropology – the study of human behavior in the past and present." Paul Bahn has described archaeoastronomy as an area of cognitive archaeology. Other researchers relate archaeoastronomy to the history of science, either as it relates to a culture's observations of nature and the conceptual framework they devised to impose an order on those observations or as it relates to the political motives which drove particular historical actors to deploy certain astronomical concepts or techniques. Art historian Richard Poss took a more flexible approach, maintaining that the astronomical rock art of the North American Southwest should be read employing "the hermeneutic traditions of western art history and art criticism" Astronomers, however, raise different questions, seeking to provide their students with identifiable precursors of their discipline, and are especially concerned with the important question of how to confirm that specific sites are, indeed, intentionally astronomical. The reactions of professional archaeologists to archaeoastronomy have been decidedly mixed. Some expressed incomprehension or even hostility, varying from a rejection by the archaeological mainstream of what they saw as an archaeoastronomical fringe to an incomprehension between the cultural focus of archaeologists and the quantitative focus of early archaeoastronomers. Yet archaeologists have increasingly come to incorporate many of the insights from archaeoastronomy into archaeology textbooks and, as mentioned above, some students wrote archaeology dissertations on archaeoastronomical topics. Since archaeoastronomers disagree so widely on the characterization of the discipline, they even dispute its name. All three major international scholarly associations relate archaeoastronomy to the study of culture, using the term Astronomy in Culture or a translation. Michael Hoskin sees an important part of the discipline as fact-collecting, rather than theorizing, and proposed to label this aspect of the discipline Archaeotopography. Ruggles and Saunders proposed Cultural Astronomy as a unifying term for the various methods of studying folk astronomies. Others have argued that astronomy is an inaccurate term, what are being studied are cosmologies and people who object to the use of logos have suggested adopting the Spanish cosmovisión. When debates polarise between techniques, the methods are often referred to by a colour code, based on the colours of the bindings of the two volumes from the first Oxford Conference, where the approaches were first distinguished. Green (Old World) archaeoastronomers rely heavily on statistics and are sometimes accused of missing the cultural context of what is a social practice. Brown (New World) archaeoastronomers in contrast have abundant ethnographic and historical evidence and have been described as 'cavalier' on matters of measurement and statistical analysis. Finding a way to integrate various approaches has been a subject of much discussion since the early 1990s. Green Archaeoastronomy is named after the cover of the book Archaeoastronomy in the Old World. It is based primarily on statistics and is particularly apt for prehistoric sites where the social evidence is relatively scant compared to the historic period. The basic methods were developed by Alexander Thom during his extensive surveys of British megalithic sites. Thom wished to examine whether or not prehistoric peoples used high-accuracy astronomy. He believed that by using horizon astronomy, observers could make estimates of dates in the year to a specific day. The observation required finding a place where on a specific date the Sun set into a notch on the horizon. A common theme is a mountain which blocked the Sun, but on the right day would allow the tiniest fraction to re-emerge on the other side for a 'double sunset'. The animation below shows two sunsets at a hypothetical site, one the day before the summer solstice and one at the summer solstice, which has a double sunset. To test this idea he surveyed hundreds of stone rows and circles. Any individual alignment could indicate a direction by chance, but he planned to show that together the distribution of alignments was non-random, showing that there was an astronomical intent to the orientation of at least some of the alignments. His results indicated the existence of eight, sixteen, or perhaps even thirty-two approximately equal divisions of the year. The two solstices, the two equinoxes and four cross-quarter days, days half-way between a solstice and the equinox were associated with the medieval Celtic calendar. While not all these conclusions have been accepted, it has had an enduring influence on archaeoastronomy, especially in Europe. Euan MacKie has supported Thom's analysis, to which he added an archaeological context by comparing Neolithic Britain to the Mayan civilization to argue for a stratified society in this period. To test his ideas he conducted a couple of excavations at proposed prehistoric observatories in Scotland. Kintraw is a site notable for its four-meter high standing stone. Thom proposed that this was a foresight to a point on the distant horizon between Beinn Shianaidh and Beinn o'Chaolias on Jura. This, Thom argued, was a notch on the horizon where a double sunset would occur at midwinter. However, from ground level, this sunset would be obscured by a ridge in the landscape, and the viewer would need to be raised by two meters: another observation platform was needed. This was identified across a gorge where a platform was formed from small stones. The lack of artifacts caused concern for some archaeologists and the petrofabric analysis was inconclusive, but further research at Maes Howe and on the Bush Barrow Lozenge led MacKie to conclude that while the term 'science' may be anachronistic, Thom was broadly correct upon the subject of high-accuracy alignments. In contrast Clive Ruggles has argued that there are problems with the selection of data in Thom's surveys. Others have noted that the accuracy of horizon astronomy is limited by variations in refraction near the horizon. A deeper criticism of Green archaeoastronomy is that while it can answer whether there was likely to be an interest in astronomy in past times, its lack of a social element means that it struggles to answer why people would be interested, which makes it of limited use to people asking questions about the society of the past. Keith Kintigh wrote: "To put it bluntly, in many cases it doesn't matter much to the progress of anthropology whether a particular archaeoastronomical claim is right or wrong because the information doesn’t inform the current interpretive questions." Nonetheless the study of alignments remains a staple of archaeoastronomical research, especially in Europe. In contrast to the largely alignment-oriented statistically led methods of Green archaeoastronomy, Brown archaeoastronomy has been identified as being closer to the history of astronomy or to cultural history, insofar as it draws on historical and ethnographic records to enrich its understanding of early astronomies and their relations to calendars and ritual. The many records of native customs and beliefs made by the Spanish chroniclers means that Brown archaeoastronomy is most often associated with studies of astronomy in the Americas. One famous site where historical records have been used to interpret sites is Chichen Itza. Rather than analysing the site and seeing which targets appear popular, archaeoastronomers have instead examined the ethnographic records to see what features of the sky were important to the Mayans and then sought archaeological correlates. One example which could have been overlooked without historical records is the Mayan interest in the planet Venus. This interest is attested to by the Dresden codex which contains tables with information about the Venus's appearances in the sky. These cycles would have been of astrological and ritual significance as Venus was associated with Quetzalcoatl or Xolotl. Associations of architectural features with settings of Venus can be found in Chichen Itza, Uxmal, and probably some other Mesoamerican sites. "El Caracol" a possible observatory temple at Chichen Itza. The Temple of the Warriors bears iconography depicting feathered serpents associated with Quetzalcoatl or Kukulcan. This means that the building's alignment towards the place on the horizon where Venus first appears in the evening sky (when it coincides with the rainy season) may be meaningful. However, since both the date and the azimuth of this event change continuously, a solar interpretation of this orientation is much more likely. Aveni claims that another building associated with the planet Venus in the form of Kukulcan, and the rainy season at Chichen Itza is the Caracol. This is a building with circular tower and doors facing the cardinal directions. The base faces the most northerly setting of Venus. Additionally the pillars of a stylobate on the building's upper platform were painted black and red. These are colours associated with Venus as an evening and morning star. However the windows in the tower seem to have been little more than slots, making them poor at letting light in, but providing a suitable place to view out. Aveni states that one of the strengths of the Brown methodology is that it can explore astronomies invisible to statistical analysis and offers the astronomy of the Incas as another example. The empire of the Incas was conceptually divided using ceques radial routes emanating from the capital at Cusco. Thus there are alignments in all directions which would suggest there is little of astronomical significance, However, ethnohistorical records show that the various directions do have cosmological and astronomical significance with various points in the landscape being significant at different times of the year. In eastern Asia archaeoastronomy has developed from the History of Astronomy and much archaeoastronomy is searching for material correlates of the historical record. This is due to the rich historical record of astronomical phenomena which, in China, stretches back into the Han dynasty, in the second century BC. A criticism of this method is that it can be statistically weak. Schaefer in particular has questioned how robust the claimed alignments in the Caracol are. Because of the wide variety of evidence, which can include artefacts as well as sites, there is no one way to practice archaeoastronomy. Despite this it is accepted that archaeoastronomy is not a discipline that sits in isolation. Because archaeoastronomy is an interdisciplinary field, whatever is being investigated should make sense both archaeologically and astronomically. Studies are more likely to be considered sound if they use theoretical tools found in archaeology like analogy and homology and if they can demonstrate an understanding of accuracy and precision found in astronomy. Both quantitative analyses and interpretations based on ethnographic analogies and other contextual evidence have recently been applied in systematic studies of architectural orientations in the Maya area and in other parts of Mesoamerica. Because archaeoastronomy is about the many and various ways people interacted with the sky, there are a diverse range of sources giving information about astronomical practices. A common source of data for archaeoastronomy is the study of alignments. This is based on the assumption that the axis of alignment of an archaeological site is meaningfully oriented towards an astronomical target. Brown archaeoastronomers may justify this assumption through reading historical or ethnographic sources, while Green archaeoastronomers tend to prove that alignments are unlikely to be selected by chance, usually by demonstrating common patterns of alignment at multiple sites. An alignment is calculated by measuring the azimuth, the angle from north, of the structure and the altitude of the horizon it faces The azimuth is usually measured using a theodolite or a compass. A compass is easier to use, though the deviation of the Earth's magnetic field from true north, known as its magnetic declination must be taken into account. Compasses are also unreliable in areas prone to magnetic interference, such as sites being supported by scaffolding. Additionally a compass can only measure the azimuth to a precision of a half a degree. A theodolite can be considerably more accurate if used correctly, but it is also considerably more difficult to use correctly. There is no inherent way to align a theodolite with North and so the scale has to be calibrated using astronomical observation, usually the position of the Sun. Because the position of celestial bodies changes with the time of day due to the Earth's rotation, the time of these calibration observations must be accurately known, or else there will be a systematic error in the measurements. Horizon altitudes can be measured with a theodolite or a clinometer. For artifacts such as the Sky Disc of Nebra, alleged to be a Bronze Age artefact depicting the cosmos, the analysis would be similar to typical post-excavation analysis as used in other sub-disciplines in archaeology. An artefact is examined and attempts are made to draw analogies with historical or ethnographical records of other peoples. The more parallels that can be found, the more likely an explanation is to be accepted by other archaeologists. A more mundane example is the presence of astrological symbols found on some shoes and sandals from the Roman Empire. The use of shoes and sandals is well known, but Carol van Driel-Murray has proposed that astrological symbols etched onto sandals gave the footwear spiritual or medicinal meanings. This is supported through citation of other known uses of astrological symbols and their connection to medical practice and with the historical records of the time. 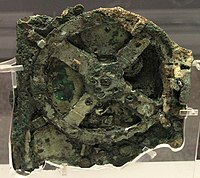 Another well-known artefact with an astronomical use is the Antikythera mechanism. In this case analysis of the artefact, and reference to the description of similar devices described by Cicero, would indicate a plausible use for the device. The argument is bolstered by the presence of symbols on the mechanism, allowing the disc to be read. Art and inscriptions may not be confined to artefacts, but also appear painted or inscribed on an archaeological site. Sometimes inscriptions are helpful enough to give instructions to a site's use. For example, a Greek inscription on a stele (from Itanos) has been translated as:"Patron set this up for Zeus Epopsios. Winter solstice. Should anyone wish to know: off ‘the little pig’ and the stele the sun turns." From Mesoamerica come Mayan and Aztec codices. These are folding books made from Amatl, processed tree bark on which are glyphs in Mayan or Aztec script. The Dresden codex contains information regarding the Venus cycle, confirming its importance to the Mayans. More problematic are those cases where the movement of the Sun at different times and seasons causes light and shadow interactions with petroglyphs. A widely known example is the Sun Dagger of Fajada Butte at which a glint of sunlight passes over a spiral petroglyph. The location of a dagger of light on the petroglyph varies throughout the year. At the summer solstice a dagger can be seen through the heart of the spiral; at the winter solstice two daggers appear to either side of it. It is proposed that this petroglyph was created to mark these events. Recent studies have identified many similar sites in the US Southwest and Northwestern Mexico. It has been argued that the number of solstitial markers at these sites provides statistical evidence that they were intended to mark the solstices. The Sun Dagger site on Fajada Butte in Chaco Canyon, New Mexico, stands out for its explicit light markings that record all the key events of both the solar and lunar cycles: summer solstice, winter solstice, equinox, and the major and minor lunar standstills of the moon's 18.6 year cycle. In addition at two other sites on Fajada Butte, there are five light markings on petroglyphs recording the summer and winter solstices, equinox and solar noon. Numerous buildings and interbuilding alignments of the great houses of Chaco Canyon and outlying areas are oriented to the same solar and lunar directions that are marked at the Sun Dagger site. If no ethnographic nor historical data are found which can support this assertion then acceptance of the idea relies upon whether or not there are enough petroglyph sites in North America that such a correlation could occur by chance. It is helpful when petroglyphs are associated with existing peoples. This allows ethnoastronomers to question informants as to the meaning of such symbols. As well as the materials left by peoples themselves, there are also the reports of other who have encountered them. The historical records of the Conquistadores are a rich source of information about the pre-Columbian Americans. Ethnographers also provide material about many other peoples. Aveni uses the importance of zenith passages as an example of the importance of ethnography. For peoples living between the tropics of Cancer and Capricorn there are two days of the year when the noon Sun passes directly overhead and casts no shadow. In parts of Mesoamerica this was considered a significant day as it would herald the arrival of rains, and so play a part in the cycle of agriculture. This knowledge is still considered important amongst Mayan Indians living in Central America today. The ethnographic records suggested to archaeoastronomers that this day may have been important to the ancient Mayans. There are also shafts known as 'zenith tubes' which illuminate subterranean rooms when the Sun passes overhead found at places like Monte Albán and Xochicalco. It is only through the ethnography that we can speculate that the timing of the illumination was considered important in Mayan society. Alignments to the sunrise and sunset on the day of the zenith passage have been claimed to exist at several sites. However, it has been shown that, since there are very few orientations that can be related to these phenomena, they likely have different explanations. Ethnographies also caution against over-interpretation of sites. At a site in Chaco Canyon can be found a pictograph with a star, crescent and hand. It has been argued by some astronomers that this is a record of the 1054 Supernova. However recent reexaminations of related 'supernova petroglyphs' raises questions about such sites in general and anthropological evidence suggests other inrepretations. The Zuni people, who claim a strong ancestral affiliation with Chaco, marked their sun-watching station with a crescent, star, hand and sundisc, similar to those found at the Chaco site. Ethnoastronomy is also an important field outside of the Americas. For example, anthropological work with Aboriginal Australians is producing much information about their Indigenous astronomies and about their interaction with the modern world. ...[A]lthough different ways to do science and different scientific results do arise in different cultures, this provides little support for those who would use such differences to question the sciences' ability to provide reliable statements about the world in which we live. Once the researcher has data to test, it is often necessary to attempt to recreate ancient sky conditions to place the data in its historical environment. To calculate what astronomical features a structure faced a coordinate system is needed. The stars provide such a system. If you were to go outside on a clear night you would observe the stars spinning around the celestial pole. This point is +90° if you are watching the North Celestial Pole or −90° if you are observing the Southern Celestial Pole. The concentric circles the stars trace out are lines of celestial latitude, known as declination. The arc connecting the points on the horizon due East and due West (if the horizon is flat) and all points midway between the Celestial Poles is the Celestial Equator which has a declination of 0°. The visible declinations vary depending where you are on the globe. Only an observer on the North Pole of Earth would be unable to see any stars from the Southern Celestial Hemisphere at night (see diagram below). Once a declination has been found for the point on the horizon that a building faces it is then possible to say whether a specific body can be seen in that direction. Diagram of the visible portions of sky at varying latitudes. While the stars are fixed to their declinations the Sun is not. The rising point of the Sun varies throughout the year. It swings between two limits marked by the solstices a bit like a pendulum, slowing as it reaches the extremes, but passing rapidly through the midpoint. If an archaeoastronomer can calculate from the azimuth and horizon height that a site was built to view a declination of +23.5° then he or she need not wait until 21 June to confirm the site does indeed face the summer solstice. For more information see History of solar observation. The Moon's appearance is considerably more complex. Its motion, like the Sun, is between two limits — known as lunistices rather than solstices. However, its travel between lunistices is considerably faster. It takes a sidereal month to complete its cycle rather than the year-long trek of the Sun. This is further complicated as the lunistices marking the limits of the Moon's movement move on an 18.6 year cycle. For slightly over nine years the extreme limits of the Moon are outside the range of sunrise. For the remaining half of the cycle the Moon never exceeds the limits of the range of sunrise. However, much lunar observation was concerned with the phase of the Moon. The cycle from one New Moon to the next runs on an entirely different cycle, the Synodic month. Thus when examining sites for lunar significance the data can appear sparse due the extremely variable nature of the moon. See Moon for more details. Finally there is often a need to correct for the apparent movement of the stars. On the timescale of human civilisation the stars have largely maintained the same position relative to each other. Each night they appear to rotate around the celestial poles due to the Earth's rotation about its axis. However, the Earth spins rather like a spinning top. Not only does the Earth rotate, it wobbles. The Earth's axis takes around 25,800 years to complete one full wobble. The effect to the archaeoastronomer is that stars did not rise over the horizon in the past in the same places as they do today. Nor did the stars rotate around Polaris as they do now. In the case of the Egyptian pyramids, it has been shown they were aligned towards Thuban, a faint star in the constellation of Draco. The effect can be substantial over relatively short lengths of time, historically speaking. For instance a person born on 25 December in Roman times would have been born with the Sun in the constellation Capricorn. In the modern period a person born on the same date would have the Sun in Sagittarius due to the precession of the equinoxes. Additionally there are often transient phenomena, events which do not happen on an annual cycle. Most predictable are events like eclipses. In the case of solar eclipses these can be used to date events in the past. A solar eclipse mentioned by Herodotus enables us to date a battle between the Medes and the Lydians, which following the eclipse failed to happen, to 28 May, 585 BC. Other easily calculated events are supernovae whose remains are visible to astronomers and therefore their positions and magnitude can be accurately calculated. Some comets are predictable, most famously Halley's Comet. Yet as a class of object they remain unpredictable and can appear at any time. Some have extremely lengthy orbital periods which means their past appearances and returns cannot be predicted. Others may have only ever passed through the Solar System once and so are inherently unpredictable. Meteor showers should be predictable, but some meteors are cometary debris and so require calculations of orbits which are currently impossible to complete. Other events noted by ancients include aurorae, sun dogs and rainbows all of which are as impossible to predict as the ancient weather, but nevertheless may have been considered important phenomena. A common justification for the need for astronomy is the need to develop an accurate calendar for agricultural reasons. Ancient texts like Hesiod's Works and Days, an ancient farming manual, would appear to partially confirm this: astronomical observations are used in combination with ecological signs, such as bird migrations to determine the seasons. Ethnoastronomical studies of the Hopi of the southwestern United States indicate that they carefully observed the rising and setting positions of the Sun to determine the proper times to plant crops. Howerver, ethnoastronomical work with the Mursi of Ethiopia shows that their luni-solar calendar was somewhat haphazard, indicating the limits of astronomical calendars in some societies. All the same, calendars appear to be an almost universal phenomenon in societies as they provide tools for the regulation of communal activities. An example of a non-agricultural calendar is the Tzolk'in calendar of the Maya civilization of pre-Columbian Mesoamerica, which is a cycle of 260 days. This count is based on an earlier calendar and is found throughout Mesoamerica. This formed part of a more comprehensive system of Maya calendars which combined a series of astronomical observations and ritual cycles. Other peculiar calendars include ancient Greek calendars. These were nominally lunar, starting with the New Moon. In reality the calendar could pause or skip days with confused citizens inscribing dates by both the civic calendar and ton theoi, by the moon. The lack of any universal calendar for ancient Greece suggests that coordination of panhellenic events such as games or rituals could be difficult and that astronomical symbolism may have been used as a politically neutral form of timekeeping. Orientation measurements in Greek temples and Byzantine churches have been associated to deity's name day, festivities, and special events. The constellation Argo Navis drawn by Johannes Hevelius in 1690. Another motive for studying the sky is to understand and explain the universe. In these cultures myth was a tool for achieving this and the explanations, while not reflecting the standards of modern science, are cosmologies. The Incas arranged their empire to demonstrate their cosmology. The capital, Cusco, was at the centre of the empire and connected to it by means of ceques, conceptually straight lines radiating out from the centre. These ceques connected the centre of the empire to the four suyus, which were regions defined by their direction from Cusco. The notion of a quartered cosmos is common across the Andes. Gary Urton, who has conducted fieldwork in the Andean villagers of Misminay, has connected this quartering with the appearance of the Milky Way in the night sky. In one season it will bisect the sky and in another bisect it in a perpendicular fashion. The importance of observing cosmological factors is also seen on the other side of the world. The Forbidden City in Beijing is laid out to follow cosmic order though rather than observing four directions. The Chinese system was composed of five directions: North, South, East, West and Centre. The Forbidden City occupied the centre of ancient Beijing. One approaches the Emperor from the south, thus placing him in front of the circumpolar stars. This creates the situation of the heavens revolving around the person of the Emperor. The Chinese cosmology is now better known through its export as feng shui. There is also much information about how the universe was thought to work stored in the mythology of the constellations. The Barasana of the Amazon plan part of their annual cycle based on observation of the stars. When their constellation of the Caterpillar-Jaguar (roughly equivalent to the modern Scorpius) falls they prepare to catch the pupating caterpillars of the forest as they fall from the trees. The caterpillars provide food at a season when other foods are scarce. A more well-known source of constellation myth are the texts of the Greeks and Romans. The origin of their constellations remains a matter of vigorous and occasionally fractious debate. The loss of one of the sisters, Merope, in some Greek myths may reflect an astronomical event wherein one of the stars in the Pleiades disappeared from view by the naked eye. Giorgio de Santillana, professor of the History of Science in the School of Humanities at the Massachusetts Institute of Technology, along with Hertha von Dechend believed that the old mythological stories handed down from antiquity were not random fictitious tales but were accurate depictions of celestial cosmology clothed in tales to aid their oral transmission. The chaos, monsters and violence in ancient myths are representative of the forces that shape each age. They believed that ancient myths are the remains of preliterate astronomy that became lost with the rise of the Greco-Roman civilization. Santillana and von Dechend in their book Hamlet's Mill, An Essay on Myth and the Frame of Time (1969) clearly state that ancient myths have no historical or factual basis other than a cosmological one encoding astronomical phenomena, especially the precession of the equinoxes. Santillana and von Dechend's approach is not widely accepted. The Precinct of Amun-Re was aligned on the midwinter solstice. By including celestial motifs in clothing it becomes possible for the wearer to make claims the power on Earth is drawn from above. It has been said that the Shield of Achilles described by Homer is also a catalogue of constellations. In North America shields depicted in Comanche petroglyphs appear to include Venus symbolism. Solsticial alignments also can be seen as displays of power. When viewed from a ceremonial plaza on the Island of the Sun (the mythical origin place of the Sun) in Lake Titicaca, the Sun was seen to rise at the June solstice between two towers on a nearby ridge. The sacred part of the island was separated from the remainder of it by a stone wall and ethnographic records indicate that access to the sacred space was restricted to members of the Inca ruling elite. Ordinary pilgrims stood on a platform outside the ceremonial area to see the solstice Sun rise between the towers. In Egypt the temple of Amun-Re at Karnak has been the subject of much study. Evaluation of the site, taking into account the change over time of the obliquity of the ecliptic show that the Great Temple was aligned on the rising of the midwinter Sun. The length of the corridor down which sunlight would travel would have limited illumination at other times of the year. In a later period the Serapeum in Alexandria was also said to have contained a solar alignment so that, on a specific sunrise, a shaft of light would pass across the lips of the statue of Serapis thus symbolising the Sun saluting the god. Clive Ruggles and Michel Cotte recently edited a book on heritage sites of astronomy and archaeoastronomy that provides a list of the main sites around the world. At Stonehenge in England and at Carnac in France, in Egypt and Yucatán, across the whole face of the earth, are found mysterious ruins of ancient monuments, monuments with astronomical significance... They mark the same kind of commitment that transported us to the moon and our spacecraft to the surface of Mars. The sunlight enters the tomb at Newgrange via the roofbox built above the door. ...[F]ew people - archaeologists or astronomers- have doubted that a powerful astronomical symbolism was deliberately incorporated into the monument, demonstrating that a connection between astronomy and funerary ritual, at the very least, merits further investigation. Since the first modern measurements of the precise cardinal orientations of the pyramids by Flinders Petrie, various astronomical methods have been proposed for the original establishment of these orientations. It was recently proposed that this was done by observing the positions of two stars in the Plough / Big Dipper which was known to Egyptians as the thigh. It is thought that a vertical alignment between these two stars checked with a plumb bob was used to ascertain where north lay. The deviations from true north using this model reflect the accepted dates of construction. Some have argued that the pyramids were laid out as a map of the three stars in the belt of Orion, although this theory has been criticized by reputable astronomers. The site was instead probably governed by a spectacular hierophany which occurs at the summer solstice, when the Sun, viewed from the Sphinx terrace, forms - together with the two giant pyramids - the symbol Akhet, which was also the name of the Great Pyramid. Further, the south east corners of all the three pyramids align towards the temple of Heliopolis, as first discovered by the Egyptologist Mark Lehner. The astronomical ceiling of the tomb of Senenmut (c. 1470 BC) contains the Celestial Diagram depicting circumpolar constellations in the form of discs. Each disc is divided into 24 sections suggesting a 24-hour time period. Constellations are portrayed as sacred deities of Egypt. The observation of lunar cycles is also evident. El Castillo, also known as Kukulcán's Pyramid, is a Mesoamerican step-pyramid built in the centre of Mayan center of Chichen Itza in Mexico. Several architectural features have suggested astronomical elements. Each of the stairways built into the sides of the pyramid has 91 steps. Along with the extra one for the platform at the top, this totals 365 steps, which is possibly one for each day of the year (365.25) or the number of lunar orbits in 10,000 rotations (365.01). A visually striking effect is seen every March and September as an unusual shadow occurs around the equinoxes. A shadow appears to descend the west balustrade of the northern stairway. The visual effect is of a serpent descending the stairway, with its head at the base in light. Additionally the western face points to sunset around 25 May, traditionally the date of transition from the dry to the rainy season. The intended alignment was, however, likely incorporated in the northern (main) facade of the temple, as it corresponds to sunsets on May 20 and July 24, recorded also by the central axis of Castillo at Tulum. The two dates are separated by 65 and 300 days, and it has been shown that the solar orientations in Mesoamerica regularly correspond to dates separated by calendrically significant intervals (multiples of 13 and 20 days). The Sun rising over Stonehenge at the 2005 Summer Solstice. Many astronomical alignments have been claimed for Stonehenge, a complex of megaliths and earthworks in the Salisbury Plain of England. The most famous of these is the midsummer alignment, where the Sun rises over the Heel Stone. However, this interpretation has been challenged by some archaeologists who argue that the midwinter alignment, where the viewer is outside Stonehenge and sees the Sun setting in the henge, is the more significant alignment, and the midsummer alignment may be a coincidence due to local topography. As well as solar alignments, there are proposed lunar alignments. The four station stones mark out a rectangle. The short sides point towards the midsummer sunrise and midwinter sunset. The long sides if viewed towards the south-east, face the most southerly rising of the Moon. Aveni notes that these lunar alignments have never gained the acceptance that the solar alignments have received. The Heel Stone azimuth is one-seventh of circumference, matching the latitude of Avebury, while summer solstice sunrise azimuth is no longer equal to the construction era direction. The interior of Maeshowe chambered tomb. This is an architecturally outstanding Neolithic chambered tomb on the Mainland of Orkney, Scotland – probably dating to the early 3rd millennium BC, and where the setting Sun at midwinter shines down the entrance passage into the central chamber (see Newgrange). In the 1990s further investigations were carried out to discover whether this was an accurate or an approximate solar alignment. Several new aspects of the site were discovered. In the first place the entrance passage faces the hills of the island Hoy, about 10 miles away. Secondly, it consists of two straight lengths, angled at a few degrees to each other. Thirdly, the outer part is aligned towards the midwinter sunset position on a level horizon just to the left of Ward Hill on Hoy. Fourthly the inner part points directly at the Barnhouse standing stone about 400m away and then to the right end of the summit of Ward Hill, just before it dips down to the notch between it at Cuilags to the right. This indicated line points to sunset on the first Sixteenths of the solar year (according to A. Thom) before and after the winter solstice and the notch at the base of the right slope of the Hill is at the same declination. Fourthly a similar 'double sunset' phenomenon is seen at the right end of Cuilags, also on Hoy; here the date is the first Eighth of the year before and after the winter solstice, at the beginning of November and February respectively – the Old Celtic festivals of Samhain and Imbolc. This alignment is not indicated by an artificial structure but gains plausibility from the other two indicated lines. Maeshowe is thus an extremely sophisticated calendar site which must have been positioned carefully in order to use the horizon foresights in the ways described. The Palace of the Governor at Uxmal. Uxmal is a Mayan city in the Puuc Hills of Yucatán Peninsula, Mexico. 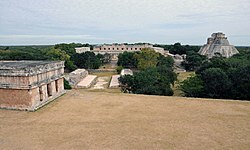 The Governor's Palace at Uxmal is often used as an exemplar of why it is important to combine ethnographic and alignment data. The palace is aligned with an azimuth of 118° on the pyramid of Cehtzuc. This alignment corresponds approximately to the southernmost rising and, with a much greater precision, to the northernmost setting of Venus; both phenomena occur once every eight years. By itself this would not be sufficient to argue for a meaningful connection between the two events. The palace has to be aligned in one direction or another and why should the rising of Venus be any more important than the rising of the Sun, Moon, other planets, Sirius et cetera? The answer given is that not only does the palace point towards significant points of Venus, it is also covered in glyphs which stand for Venus and Mayan zodiacal constellations. Moreover, the great northerly extremes of Venus always occur in late April or early May, coinciding with the onset of the rainy season. The Venus glyphs placed in the cheeks of the Maya rain god Chac, most likely referring to the concomitance of these phenomena, support the west-working orientation scheme. The Great Kiva at Chaco Canyon. In Chaco Canyon, the center of the ancient Pueblo culture in the American Southwest, numerous solar and lunar light markings and architectural and road alignments have been documented. These findings date to the 1977 discovery of the Sun Dagger site by Anna Sofaer. Three large stone slabs leaning against a cliff channel light and shadow markings onto two spiral petroglyphs on the cliff wall, marking the solstices, equinoxes and the lunar standstills of the 18.6 year cycle of the moon. Subsequent research by the Solstice Project and others demonstrated that numerous building and interbuilding alignments of the great houses of Chaco Canyon are oriented to solar, lunar and cardinal directions. In addition, research shows that the Great North Road, a thirty-five mile engineered “road”, was constructed not for utilitarian purposes but rather to connect the ceremonial center of Chaco Canyon with the direction north. According to Rappenglueck, the eyes of the bull, the bird, and the bird-man may represent the three stars Vega, Altair, and Deneb commonly known as the Summer Triangle. At least now we have all the archaeological facts to go along with the astronomers, the Druids, the Flat Earthers and all the rest. Archaeoastronomy owes something of this poor reputation among scholars to its occasional misuse to advance a range of pseudo-historical accounts. During the 1930s, Otto S. Reuter compiled a study entitled Germanische Himmelskunde, or "Teutonic Skylore". The astronomical orientations of ancient monuments claimed by Reuter and his followers would place the ancient Germanic peoples ahead of the Ancient Near East in the field of astronomy, demonstrating the intellectual superiority of the "Aryans" (Indo-Europeans) over the Semites. Since the 19th century, numerous scholars have sought to use archaeoastronomical calculations to demonstrate the antiquity of Ancient Indian Vedic culture, computing the dates of astronomical observations ambiguously described in ancient poetry to as early as 4000 BC. David Pingree, a historian of Indian astronomy, condemned "the scholars who perpetrate wild theories of prehistoric science and call themselves archaeoastronomers." More recently Gallagher, Pyle, and Fell interpreted inscriptions in West Virginia as a description in Celtic Ogham alphabet of the supposed winter solstitial marker at the site. The controversial translation was supposedly validated by a problematic archaeoastronomical indication in which the winter solstice Sun shone on an inscription of the Sun at the site. Subsequent analyses criticized its cultural inappropriateness, as well as its linguistic and archeaoastronomical claims, to describe it as an example of "cult archaeology". Archaeoastronomy is sometimes related to the fringe discipline of Archaeocryptography, when its followers attempt to find underlying mathematical orders beneath the proportions, size, and placement of archaeoastronomical sites such as Stonehenge and the Pyramid of Kukulcán at Chichen Itza. There are currently three academic organisations for scholars of archaeoastronomy. ISAAC—the International Society for Archaeoastronomy and Astronomy in Culture—was founded in 1995 and now sponsors the Oxford conferences and Archaeoastronomy — the Journal of Astronomy in Culture. SEAC— La Société Européenne pour l’Astronomie dans la Culture—is slightly older; it was created in 1992. SEAC holds annual conferences in Europe and publishes refereed conference proceedings on an annual basis. There is also SIAC— La Sociedad Interamericana de Astronomía en la Cultura, primarily a Latin American organisation which was founded in 2003. Two new organisations focused on regional archaeoastronomy were founded in 2013: ASIA - the Australian Society for Indigenous Astronomy in Australia and SMART - the Society of Māori Astronomy Research and Traditions in New Zealand. Additionally the Journal for the History of Astronomy publishes many archaeoastronomical papers. For twenty-seven volumes (from 1979 to 2002) it published an annual supplement Archaeoastronomy. The Journal of Astronomical History and Heritage (National Astronomical Research Institute of Thailand), Culture & Cosmos (University of Wales, UK) and Mediterranean Archaeology and Archaeometry (University of Aegean, Greece) also publish papers on archaeoastronomy. Various national archaeoastronomical projects have been undertaken. Among them is the program at the Tata Institute of Fundamental Research named "Archaeo Astronomy in Indian Context" that has made interesting findings in this field. Wikimedia Commons has media related to Archaeoastronomy. List of archaeoastronomical sites sorted by country Sites where claims for the use of astronomy have been made. List of artefacts of archaeoastronomical significance Artefacts which have been interpreted as being used for some astronomical purpose. ^ Šprajc, Ivan (1996). La estrella de Quetzalcóatl: El planeta Venus en Mesoamérica. Mexico City: Editorial Diana. ISBN 978-968-13-2947-1. ^ Sánchez Nava, Pedro Francisco; Šprajc, Ivan (2015). Orientaciones astronómicas en la arquitectura maya de las tierras bajas. Mexico City: Instituto Nacional de Antropología e Historia. ISBN 978-607-484-727-7. ^ González-García, A. César; Šprajc, Ivan (2016). "Astronomical significance of architectural orientations in the Maya Lowlands: A statistical approach". Journal of Archaeological Science: Reports. 9: 191–202. doi:10.1016/j.jasrep.2016.07.020. ^ Šprajc, Ivan (2017). "Astronomy, Architecture, and Landscape in Prehispanic Mesoamerica". Journal of Archaeological Research. 26 (2): 197–251. doi:10.1007/s10814-017-9109-z. ^ "Brunton Pocket Transit Instruction Manual" (PDF). p. 22. Archived from the original (PDF) on 2006-03-04. Retrieved 2008-03-02. ^ Herodotus. The Histories I.74. Retrieved 2008-03-22. ^ Predicting the next bright comet, Space.com. ^ Liritzis, I; Vassiliou, H (2002). "Astronomical orientations of ancient temples at Rhodes and Attica with a tentative interpretation". Mediterranean Archaeology & Archaeometry. 2 (1): 69–79. Bibcode:2002MAA.....2...69L. ^ Giorgio de Santillana & Hertha von Dechend, Hamlet's Mill, David R Godine: Boston, 1977. ^ Šprajc, Ivan; Sánchez Nava, Pedro Francisco (2013). "Astronomía en la arquitectura de Chichén Itzá: una reevaluación". Estudios de Cultura Maya. XLI: 31–60. ^ Šprajc, I. (2018). "Astronomy, Architecture, and Landscape in Prehispanic Mesoamerica". Journal of Archaeological Research. 26 (2): 197–251. doi:10.1007/s10814-017-9109-z. ^ Sofaer 1998. Lekson Ed, U of Utah: 165. ^ Sofaer, Marshall and Sinclair, 1989. Cambridge: 112. ^ Whitehouse, David (9 August 2000). "Ice Age star map discovered". BBC News. Retrieved 30 December 2012. ^ "Vallée des Merveilles" (in French). Archeociel. Archived from the original on 2010-12-18. Retrieved 1 January 2011. ^ "Archeociel: Chantal Jègues Wolkiewiez" (in French). Retrieved 1 January 2011. 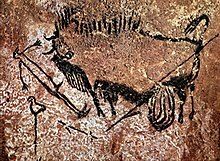 ^ "The Lascaux cave: a Prehistoric sky-map..." lightmeditation. Retrieved 1 January 2011. ^ Sir Jocelyn Stephens quoted in The Times, 8 July 1994, 8. ^ Schmeh, Klaus (2012), "The Pathology of Cryptology—A Current Survey", Cryptologia, 36: 14–45, doi:10.1080/01611194.2011.632803, at pp. 19-20. Aldana, G. (2007). The Apotheosis of Janaab' Pakal: Science, History, and Religion at Classic Maya Palenque. Boulder: University Press of Colorado. ISBN 978-0-87081-866-0. Atkinson, R.J.C. (1966). "Moonshine on Stonehenge". Antiquity. 49 (159): 212–6. doi:10.1017/S0003598X0003252X. Aveni, A.F. (1979). "Astronomy in Ancient Mesoamerica". In E.C. Krupp (ed.). In Search of Ancient Astronomies. Chatto and Windus. pp. 154–185. ISBN 978-0-7011-2314-7. Aveni, A.F. (1980). Skywatchers of Ancient Mexico. University of Texas. ISBN 978-0-292-77578-7. Aveni, A.F. (1981). "Archaeoastronomy". In Michael B. Schiffer (ed.). Advances in Archaeological Method and Theory. 4. Academic Press. p. 177. ISBN 978-0-12-003104-7. Aveni. A.F., ed. (1982). Archaeoastronomy in the New World: American Primitive Astronomy. Cambridge University Press. ISBN 978-0-521-24731-3. Aveni. A.F. (1986). "Archaeoastronomy: Past, Present and Future". Sky and Telescope. 72: 456–60. Bibcode:1986S&T....72..456A. Aveni, A.F. (1989a). World Archaeoastronomy. Cambridge University Press. ISBN 978-0-521-34180-6. Aveni, A.F. (1989b). Empires of Time. Basic Books. ISBN 978-0-465-01950-2. Aveni, A.F. (1997). Stairways to the Stars: Skywatching in Three Great Ancient Cultures. John Wiley and Sons. ISBN 978-0-471-32976-3. Aveni. A.F. (2003). "Archaeoastronomy in the Ancient Americas" (PDF). Journal of Archaeological Research. 11 (2): 149–91. doi:10.1023/A:1022971730558. Aveni, A.F. (2006). "Evidence and Intentionality: On Evidence in Archaeoastronomy". In Todd W. Bostwick; Bryan Bates (eds.). Viewing the Sky Through Past and Present Cultures: Selected Papers from the Oxford VII International Conference on Archaeoastronomy. Pueblo Grande Museum Anthropological Papers. 15. City of Phoenix Parks and Recreation Department. pp. 57–70. ISBN 978-1-882572-38-0. Bahn, P. (1995). Archaeology: A Very Short introduction. Oxford University Press. ISBN 978-0-19-285379-0. Bauer, B. & Dearborn, D. (1995). Astronomy and empire in the ancient Andes: the cultural origins of Inca sky watching. University of Texas. ISBN 978-0-292-70837-2. Belmonte, J. A. (2001). "On the Orientation of Old Kingdom Egyptian Pyramids". Archaeoastronomy: Supplement to the Journal for the History of Astronomy. 32 (26): S1–S20. Bibcode:2001JHAS...32....1B. Blomberg, P. (2003). "The early Hellenic Sky Map reconstructed from Archaeoastronomical and Textual Studies". In Amanda-Alice Maravelia (ed.). Ad Astra per Aspera et per Ludum: European Archaeoastronomy and the Orientation of Munuments in the Mediterranean Basin: Papers from Session I.13, held at the European Association of Archaeologists Eighth Annual Meeting in Thessaloniki 2002. BAR International Series 1154. Archaeopress. pp. 71–76. ISBN 978-1-84171-524-7. Bostwick, T.W. (2006). "Archaeoastronomy at the Gates of Orthodoxy: Introduction to the Oxford VII Conference on Archaeoastronomy Papers". In Todd W. Bostwick; Bryan Bates (eds.). Viewing the Sky Through Past and Present Cultures: Selected Papers from the Oxford VII International Conference on Archaeoastronomy. Pueblo Grande Museum Anthropological Papers. 15. City of Phoenix Parks and Recreation Department. pp. 1–10. ISBN 978-1-882572-38-0. Brandt, J.C. & Williamson, R.A. (1979). "The 1054 Supernova and American Rock Art". Archaeoastronomy: Supplement to the Journal for the History of Astronomy. 1 (10): S1–S38. Bibcode:1979JHAS...10....1B. Broda, J. (2000). "Mesoamerican Archaeoastronomy and the Ritual Calendar". In Helaine Selin (ed.). Astronomy Across Cultures. Kluwer, Dordrect. pp. 225–267. ISBN 978-0-7923-6363-7. Broda, J. (2006). "Zenith Observations and the Conceptualization of Geographical Latitude in Ancient Mesoamerica: A Historical Interdisciplinary Approach". In Todd W. Bostwick; Bryan Bates (eds.). Viewing the Sky Through Past and Present Cultures; Selected Papers from the Oxford VII International Conference on Archaeoastronomy. Pueblo Grande Museum Anthropological Papers. 15. City of Phoenix Parks and Recreation Department. pp. 183–212. ISBN 978-1-882572-38-0. Cairns, H.C. (2005). "Discoveries in Aboriginal Sky Mapping (Australia)". In John W. Fountain; Rolf M. Sinclair (eds.). Current Studies in Archaeoastronomy: Conversations Across Time and Space. Durham, North Carolina: Carolina Academic Press. pp. 523–538. ISBN 978-0-89089-771-3. Carlson, J. (Fall 1999). "Editorial: A Professor of Our Own". Archaeoastronomy & Ethnoastronomy News (Autumn Equinox). 33. Retrieved 2008-03-22. Chamberlain, V.D. & Young, M.J. (2005). "Introduction". In Von Del Chamberlain; John Carlson & M. Jane Young (eds.). Songs from the Sky: Indigenous Astronomical and Cosmological Traditions of the World. Ocarina Books. pp. xi–xiv. ISBN 978-0-9540867-2-5. Chiu, B.C. & Morrison, P. (1980). "Astronomical Origin of the Offset Street Grid at Teotihuacan". Archaeoastronomy: Supplement to the Journal for the History of Astronomy. 11 (18): S55–S64. Bibcode:1980JHAS...11...55C. Dearborn, D.S.P. ; Seddon, M.F. & Bauer, B.S. (1998). "The Sanctuary of Titicaca: Where the Sun Returns to Earth". Latin American Antiquity. 9 (3): 240–258. doi:10.2307/971730. JSTOR 971730. Eogan, G. (1991). "Prehistoric and Early Historic Cultural Change at Brugh na Bóinne". Proceedings of the Royal Irish Academy. 91C: 105–132. Fairall, A. (1999). "Precession and the layout of the Ancient Egyptian pyramids". Astronomy & Geophysics. 40 (4). Archived from the original on 2008-02-28. Retrieved 2008-03-22. Fell, B. (1983). "Christian Messages in Old Irish Script Deciphered from Rock Carvings in W. VA". Wonderful West Virginia (47): 12–19. Archived from the original on 9 May 2008. Retrieved 2008-04-27. Fisher, V.B. (2006). "Ignoring Archaeoastronomy: A Dying Tradition in American Archaeology". In Todd W. Bostwick; Bryan Bates (eds.). Viewing the Sky Through Past and Present Cultures; Selected Papers from the Oxford VII International Conference on Archaeoastronomy. Pueblo Grande Museum Anthropological Papers. 15. City of Phoenix Parks and Recreation Department. pp. 1–10. ISBN 978-1-882572-38-0. Fountain, J. (2005). "A Database of Rock Art Solar Markers". In John W. Fountain; Rolf M. Sinclair (eds.). Current Studies in Archaeoastronomy: Conversations Across Time and Space. Durham, North Carolina: Carolina Academic Press. ISBN 978-0-89089-771-3. Freeth, T; Bitsakis, Y; Moussas, X; Seiradakis, JH; Tselikas, A; Mangou, H; Zafeiropoulou, M; Hadland, R; et al. (30 November 2006). "Decoding the ancient Greek astronomical calculator known as the Antikythera Mechanism". Nature. 444 (7119): 587–591. Bibcode:2006Natur.444..587F. doi:10.1038/nature05357. PMID 17136087. Gallagher, I.J. (1983). "Light Dawns on West Virginia History". Wonderful West Virginia (47): 7–11. Archived from the original on 11 May 2008. Retrieved 2008-04-27. Gingerich, O. (24 March 2000). "Stone and star gazing". Times Higher Education Supplement: 24. Retrieved 2008-03-22. Gummerman, G.J. & Warburton, M (2005). "The Universe in Cultural Context: An Essay". In John W. Fountain & Rolf M. Sinclair (eds.). Current Studies in Archaeoastronomy: Conversations Across Time and Space. Durham, North Carolina: Carolina Academic Press. ISBN 978-0-89089-771-3. Hamacher, D.W. (2012). On the Astronomical Knowledge and Traditions of Aboriginal Australians. PhD Thesis: Macquarie University, Sydney, Australia. Hancock, G (1996). Fingerprints of the Gods. New York: Three Rivers Press. ISBN 978-0-517-88729-5. Hannah, R (1994). "The Constellations on Achilles' Shield (Iliad 18. 485–489)". Electronic Antiquity. II.4. Archived from the original on 21 April 2008. Retrieved 2008-03-22. Hawkins, G (1976). Stonehenge Decoded. Fontana. ISBN 978-0-00-632315-0. Heggie, D.C. (1982). Archaeoastronomy in the Old World. CUP. ISBN 978-0-521-24734-4. Hicks, R. (Fall 1993). "Beyond Alignments". Archaeoastronomy & Ethnoastronomy News (September Equinox). 9. Retrieved 2008-03-22. Hoskin, M (1996). "Book Reviews: Proceedings of Oxford 3". Archaeoastronomy: Supplement to the Journal for the History of Astronomy. 21 (27): S85–S87. Bibcode:1996JHAS...27...85H. Hoskin, M (1999). The Cambridge Concise History of Astronomy. CUP. ISBN 978-0-521-57600-0. Hoskin, M. (2001). Tombs, Temples, and Their Orientations: A New Perspective on Mediterranean Prehistory. Ocarina Books. ISBN 978-0-9540867-1-8. Hugh-Jones, Stephen (1982). "The Pleiades and Scorpius in Barasana Cosmology". In Anthony F. Aveni; Gary Urton (eds.). Ethnoastronomy and Archaeoastronomy in the American Tropics. Annals of the New York Academy of Sciences. 385. New York, New York: New York Academy of Sciences. pp. 183–201. Bibcode:1982NYASA.385..183H. doi:10.1111/j.1749-6632.1982.tb34265.x. ISBN 978-0-89766-160-7. Isager, S. & Skydsgaard, J.E. (1992). Ancient Greek Agriculture. Routledge. ISBN 978-0-415-00164-9. Iwaniszewski, S. (Winter 1995). "Alignments and Orientations Again". Archaeoastronomy & Ethnoastronomy News (December Solstice). 18. Retrieved 2008-03-22. Iwaniszewski, S. (2001). "Time and space in social systems - further issues for theoretical archaeoastronomy". In Clive Ruggles; Frank Prendergast; Tom Ray (eds.). Astronomy, Cosmology and Landscape: Proceedings of the SEAC 98 Meeting, Dublin, Ireland. Ocarina Books. pp. 1–7. ISBN 978-0-9540867-0-1. Iwaniszewski, S. (2003). "The erratic ways of studying astronomy in culture". In Mary Blomberg; Peter E. Blomberg; Göran Henriksson (eds.). Calendars, Symbols and Orientations: Legacies of Astronomy in Culture (Proceedings of the 9th annual meeting of the European Society from Astronomy in Culture (SEAC), Stockholm, 27–30 August 2001. Uppsala. pp. 7–10. ISBN 978-91-506-1674-3. Johnson, W. (1912). Byways of British Archaeology. Cambridge University Press. Kelley, D.H. & Milone, E.F. (2005). Exploring Ancient Skies: An Encyclopedic Survey of Archaeoastronomy. Springer-Verlag. ISBN 978-0-387-95310-6. Kintigh, K. (Fall 1992). "I wasn't going to say anything, but since you asked: Archaeoastronomy and Archaeology". Archaeoastronomy & Ethnoastronomy News (September Equinox). 5. Retrieved 2008-03-22. Krupp, E.C. (1979). In Search of Ancient Astronomies. Chatto and Windus. ISBN 978-0-7011-2314-7. Krupp, E.C. (1988). "Light in the Temples". In C.L.N. Ruggles (ed.). Records in Stone: Papers in Memory of Alexander Thom. CUP. pp. 473–499. ISBN 978-0-521-33381-8. Krupp, E.C. (1997a). Skywatchers, Shamans and Kings. John Wiley and Sons. ISBN 978-0-471-32975-6. Krupp, E.C. (February 1997). "Rambling Through the Skies: Pyramid Marketing SchemesPyramid Marketing Schemes". Sky and Telescope. 94 (2): 64. Krupp, E. C.; Billo, Evelyn; Mark, Robert (2010). "Star Trek: Recovery and Review of the First Alleged Supernova Rock Art". Archaeoastronomy: The Journal of Astronomy in Culture. 23: 35–43. Lesser, W.H. (1983). "Cult Archaeology Strikes Again: A Case for Pre-Columbian Irishmen in the Mountain State?". West Virginia Archeologist. 35: 48–52. McCluskey, S.C. (1990). "Calendars and Symbolism: Functions of Observation in Hopi Astronomy". Archaeoastronomy: Supplement to the Journal for the History of Astronomy. 21 (15): S1–S16. Bibcode:1990ArchS..15....1M. McCluskey, S.C. (2000). "The Inconstant Moon: Lunar Astronomies in Different Cultures". Archaeoastronomy: The Journal of Astronomy in Culture. 15: 14–31. Bibcode:2000Arch...15...14M. McCluskey, S.C. (2001). "Etnoscienza dei Pueblo". In Sandro Petruccioli (ed.). Storia della Scienza, vol. 2, Cina, India, Americhe, Sec. 3, "Le Civilta Precolombiane". Rome: Istituto della Enciclopedia Italiana. pp. 1002–1009. McCluskey, S.C. (2004). "The Study of Astronomies in Cultures as Reflected in Dissertations and Theses". Archaeoastronomy: The Journal of Astronomy in Culture. 16: 20–25. McCluskey, S.C. (2005). "Different Astronomies, Different Cultures and the Question of Cultural Relativism". In John W. Fountain; Rolf M. Sinclair (eds.). Current Studies in Archaeoastronomy: Conversations Across Time and Space. Carolina Academic Press. pp. 69–79. ISBN 978-0-89089-771-3. MacKie, E (1977). Science and Society in Prehistoric Britain. Paul Elek. ISBN 978-0-236-40041-6. MacKie, E (1997). "Maeshowe and the winter solstice: ceremonial aspects of the Orkney Grooved Ware culture". Antiquity. 71 (272): 338–359. doi:10.1017/S0003598X00084969. MacKie, E (2006). "New Evidence for a Professional Priesthood in the European Early Bronze Age". In Todd W. Bostwick; Bryan Bates (eds.). Viewing the Sky Through Past and Present Cultures: Selected Papers from the Oxford VII International Conference on Archaeoastronomy. Pueblo Grande Museum Anthropological Papers. 15. City of Phoenix Parks and Recreation Department. pp. 343–362. ISBN 978-1-882572-38-0. MacKie, E. W. (2009). "The Prehistoric Solar Calendar: An Out of Fashion Idea Revisited with New Evidence". Time and Mind. 2 (1): 9–46. doi:10.2752/175169709x374263. Magli, G. (2008). "On the Orientation of Roman Towns in Italy". Oxford Journal of Archaeology. 27 (1): 63–71. arXiv:physics/0703213. doi:10.1111/j.1468-0092.2007.00296.x. Magli, G. (2013). Architecture, Astronomy and Sacred Landscape in Ancient Egypt. CUP. Magli, G. (2015). Archaeoastronomy. Introduction to the science of stars and stones. Springer, NY. Meller, H. (January 2004). "Star search". National Geographic: 76–8. Michell, J. (2001). A Little History of Astro-Archaeology. Thames & Hudson. ISBN 978-0-500-27557-3. Milbraith, S. (1988). "Astronomical Images and Orientations in the Architecture of Chichen Itzá". In A.F. Aveni (ed.). New Directions in American Archaeoastronomy. BAR International Series. 454. BAR. pp. 54–79. ISBN 978-0-86054-583-5. Milbraith, S. (1999). Star Gods of the Maya: Astronomy in Art, Folklore and Calendars. University of Texas Press. ISBN 978-0-292-75226-9. Neugebauer, Otto (1980). "On the Orientation of Pyramids". Centaurus. 24 (1): 1–3. Bibcode:1980Cent...24....1N. doi:10.1111/j.1600-0498.1980.tb00362.x. O'Kelly, M.J. (1982). Newgrange: Archaeology, Art and Legend. Thames and Hudson. ISBN 978-0-500-39015-3. Parker Pearson, M (2007). "The age of Stonehenge". Antiquity. 81 (313): 617–639. doi:10.1017/s0003598x00095624. Pedersen, Olaf (1982). "The Present Position of Archaeo-Astronomy". In D. C. Heggie (ed.). Archaeoastronomy in the Old World. Cambridge: Cambridge University Press. pp. 265–274. ISBN 978-0-521-24734-4. Pingree, D. (1982). "Hellenophilia versus the History of Science". Isis. 83 (4): 554–563. Bibcode:1992Isis...83..554P. doi:10.1086/356288. . reprinted in Michael H. Shank, ed., The Scientific Enterprise in Antiquity and the Middle Ages (Chicago: Univ. of Chicago Pr., 2000), pp. 30–39. Poss, R.L. (2005). "Interpreting Rock Art: European and Anasazi Representations of Spirituality". In John W. Fountain; Rolf M. Sinclair (eds.). 'Current Studies in Archaeoastronomy: Conversations Across Time and Space. Durham, North Carolina: Carolina Academic Press. pp. 81–98. ISBN 978-0-89089-771-3. Preston R.A. & Preston A.L. (2005). "Consistent Forms of Solstice Sunlight Interaction with Petroglyphs throughout the Prehistoric American Southwest". In John W. Fountain & Rolf M. Sinclair (eds.). Current Studies in Archaeoastronomy: Conversations Across Time and Space. Durham, North Carolina: Carolina Academic Press. ISBN 978-0-89089-771-3. Pyle, R.L. (1983). "A Message from the Past". Wonderful West Virginia (47): 3–6. Archived from the original on 11 May 2008. Retrieved 2008-04-27. Robins M. & Ewing E. (1989). "The Sun is in His House: Summer Solstice at San Carlos Mesa". In Ken Hedges (ed.). Rock Art Papers, vol. 6. San Diego Museum Papers. 24. San Diego Museum. Rufinus. "The destruction of the Serapeum". Archived from the original on 6 April 2008. Retrieved 2008-03-22. Ruggles, C.L.N. (1993). Archaeoastronomy in the 1990s. Group D Publications. ISBN 978-1-874152-01-9. Ruggles, C.L.N. (1999). Astronomy in Prehistoric Britain and Ireland. Yale University Press. ISBN 978-0-300-07814-5. Ruggles, C.L.N. (2000). "Ancient Astronomies - Ancient Worlds". Archaeoastronomy: Supplement to the Journal for the History of Astronomy. 31 (25): S65–S76. Bibcode:2000JHAS...31...65R. doi:10.1177/002182860003102506. Ruggles, C.L.N. (2005). Ancient Astronomy. ABC-Clio. ISBN 978-1-85109-477-6. Ruggles, Clive L. N., ed. (2014). The Handbook of Archaeoastronomy and Ethnoastronomy. New York: Springer. doi:10.1007/978-1-4614-6141-8. ISBN 978-1-4614-6140-1. Three volumes; 217 articles. Ruggles, C.L.N. & Barclay, G. (2000). "Cosmology, calendars and society in Neolithic Orkney: a rejoinder to Euan MacKie". Antiquity. 74 (283): 62–74. doi:10.1017/S0003598X00066151. Ruggles, C.L.N. ; Cotte, M., eds. (2010). Heritage Sites of Astronomy and Archaeoastronomy in the context of the UNESCO World Heritage Convention: A Thematic Study (PDF). Paris: ICOMOS / IAU. ISBN 978-2-918086-01-7. Ruggles, C.L.N. & Saunders, N.J. (1993). "The Study of Cultural Astronomy". In Clive L.N. Ruggles & Nicholas J. Saunders (eds.). Astronomies and Cultures. University Press of Colorado. pp. 1–31. ISBN 978-0-87081-319-1. Saethre, E. (2007). "Close encounters: UFO beliefs in a remote Australian Aboriginal community". Journal of the Royal Anthropological Institute. 13 (4): 901–915. doi:10.1111/j.1467-9655.2007.00463.x. Salt, A. & Boutsikas, E. (2005). "Knowing when to consult the oracle at Delphi". Antiquity. 79 (305): 562–72. doi:10.1017/S0003598X00114504. Schaefer, B.E. (2002). "The Great Ptolemy-Hipparchus Dispute". Sky and Telescope. 103 (2): 38–66. Bibcode:2002S&T...103b..38S. Schaefer, B.E. (2006a). "Case Studies of Three of the Most Famous Claimed Archaeoastronomical Alignments in North America". In Todd W. Bostwick; Bryan Bates (eds.). Viewing the Sky Through Past and Present Cultures: Selected Papers from the Oxford VII International Conference on Archaeoastronomy. Pueblo Grande Museum Anthropological Papers. 15. City of Phoenix Parks and Recreation Department. pp. 27–56. ISBN 978-1-882572-38-0. Schaefer, B.E. (2006b). "No Astronomical Alignments at the Caracol". In Todd W. Bostwick; Bryan Bates (eds.). Viewing the Sky Through Past and Present Cultures: Selected Papers from the Oxford VII International Conference on Archaeoastronomy. Pueblo Grande Museum Anthropological Papers. 15. City of Phoenix Parks and Recreation Department. pp. 71–77. ISBN 978-1-882572-38-0. Schaefer, B. E.; Liller, W. (1990). "Refraction near the Horizon". Publications of the Astronomical Society of the Pacific. 102: 796–805. Bibcode:1990PASP..102..796S. doi:10.1086/132705. Schlosser, W. (2002). "Zur astronomischen Deuteung der Himmelschreibe vom Nebra". Archäologie in Sachsen-Anhalt. 1/02: 21–3. Selin, Helaine and Sun Xiaochun. (2000). "Astronomy Across Cultures: The History of Non-Western Astronomy". Science Across Cultures: The History of Non-Western Science. 1. Berlin: Springer. doi:10.1007/978-94-011-4179-6. ISBN 978-94-010-5820-9. Sinclair, R.M. (2005). "The Nature of Archaeoastronomy". In John W. Fountain; Rolf M. Sinclair (eds.). Current Studies in Archaeoastronomy: Conversations Across Time and Space. Carolina Academic Press. pp. 3–13. ISBN 978-0-89089-771-3. Sinclair, R.M. (2006). "The Nature of Archaeoastronomy"". In Todd W. Bostwick; Bryan Bates (eds.). Viewing the Sky Through Past and Present Cultures; Selected Papers from the Oxford VII International Conference on Archaeoastronomy. Pueblo Grande Museum Anthropological Papers. 15. City of Phoenix Parks and Recreation Department. pp. 13–26. ISBN 978-1-882572-38-0. Sofaer, A., ed. (2008). Chaco Astronomy: An Ancient American Cosmology. Santa Fe, New Mexico: Ocean Tree Books. ISBN 978-0-943734-46-0. Steel, D. (June 1999). "Stonehenge and the Terror in the Sky". British Archaeology. 45. Retrieved 2008-09-06. Spence, K (16 November 2000). "Ancient Egyptian Chronoology and the astronomical orientation of the pyramids". Nature. 408 (6810): 320–324. Bibcode:2000Natur.408..320S. doi:10.1038/35042510. PMID 11099032. Šprajc, I., and P. F. Sánchez Nava (2013). Astronomía en la arquitectura de Chichén Itzá: una reevaluación. Estudios de Cultura Maya XLI: 31–60. Thom, A. (1967). Megalithic Sites in Britain. Oxford: Clarendon Press. ISBN 978-0-19-813148-9. Thom. A.S. (1988). "A personal note about my late father, Alexander Thom". In C.L.N. Ruggles (ed.). Records in Stone: Papers in Memory of Alexander Thom. CUP. pp. 3–13. ISBN 978-0-521-33381-8. Trotter, A.P. (1927). "Stonehenge as an Astronomical Instrument". Antiquity. 1 (1): 42–53. doi:10.1017/S0003598X00000053. Turton, D. & Ruggles, C.L.N. (1978). "Agreeing to Disagree: The Measurement of Duration in a Southwestern Ethiopian Community". Current Anthropology. 19.3 (3): 585–600. doi:10.1086/202140. Urton, G. (1981). At the crossroads of the earth and the sky: an Andean cosmology. University of Texas. ISBN 978-0-292-70349-0.
van Driel-Murray, C. (2002). "Regarding the Stars". In M Carruthers; C. van Driel-Murray; A. Gardner; J. Lucas; et al. (eds.). TRAC 2001: Proceedings of the Eleventh Annual Theoretical Roman Archaeology Conference Glasgow 2001. Oxbow Books. pp. 96–103. ISBN 978-1-84217-075-5. Wise, R.B. (2003). "The Observations of the 2002 Winter Solstice at Luther Elkins Petroglyph (46 Wm 3)". Council for West Virginia Archaeology. Retrieved 2008-03-22. Williamson, Ray A. (1987). "Light and Shadow, Ritual, and Astronomy in Anasazi Structures". In John B. Carlson; W. James Judge (eds.). Astronomy and Ceremony in the Prehistoric Southwest. Papers of the Maxwell Museum of Anthropology. 2. Albuquerque, NM. pp. 71–88. ISBN 978-0-912535-03-6. Witzel, M. (May 2001). "Autochthonous Aryans? The Evidence from Old Indian and Iranian Text". Electronic Journal of Vedic Studies. 7 (3): §28–30. Archived from the original on 2008-03-28. Xu, Z.; Pankenier, D.W. & Jiang, Y. (2000). East Asian Archaeoastronomy: Historical Records of Astronomical Observations of China, Japan and Korea. Amsterdam: Gordon & Breach Science Publ. ISBN 978-90-5699-302-3. Young, M.J. (2005). "Ethnoastronomy and the Problem of Interpretation: A Zuni Example". In Von Del Chamberlain; John Carlson; M. Jane Young (eds.). Songs from the Sky: Indigenous and Cosmological Traditions of the World. Ocarina Books. ISBN 978-0-9540867-2-5. Zeilik, M. (1985). "The Ethnoastronomy of the Historic Pueblos, I: Calendrical Sun Watching". Archaeoastronomy: Supplement to the Journal for the History of Astronomy. 8 (16): S1–S24. Bibcode:1985JHAS...16....1Z. Zeilik, M. (1986). "The Ethnoastronomy of the Historic Pueblos, II: Moon Watching". Archaeoastronomy: Supplement to the Journal for the History of Astronomy. 10 (17): S1–S22. Bibcode:1986JHAS...17....1Z. Look up archaeoastronomy in Wiktionary, the free dictionary. Home page of the free Archaeoastronomy course online at the Politecnico of Milan Giulio Magli's MOOC -Archaeoastronomy. The science of stars and stones. Traditions of the Sun — NASA and others exploring the world's ancient observatories. Ancient Observatories: Timeless Knowledge NASA Poster on ancient (and modern) observatories. ISAAC, The International Society for Archaeoastronomy and Astronomy in Culture. SEAC La Société Européenne pour l'Astronomie dans la Culture. Site in English. SIAC La Sociedad Interamericana de Astronomía en la Cultura. This page was last edited on 10 March 2019, at 03:39 (UTC).